Medicinal herb for acne should aim to treat the underlying causes such as hormonal imbalances, poor digestion, sluggish liver, abnormal bowel function, and nutritional deficiencies. Topically, herbs for acne treatment mainly involves using antiseptic herbs that are applied to clean skin to keep bacteria at bay and reduce inflammation and infection. Internal use of herbs for acne treatment should address hormonal imbalances by improving liver function and enhance the body´s natural elimination of toxins by improving digestion and as a result, make the skin more clear and healthier. Which medicinal herbs to choose will depend on the underlying cause, and most skin specialists will agree that no one specific factor causes acne. What is know, is that androgen hormones at puberty increase the production of sebum in the skin of adolescents. Combined with a bacterium that naturally occurs on the skin, the increase in sebum can lead to increased bacteria, and inflammation and infection of already blocked pores. 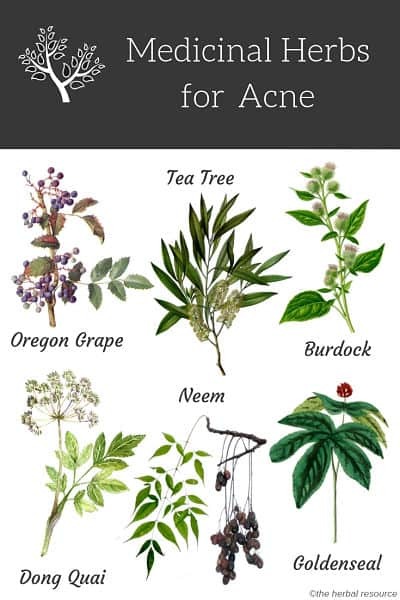 Medicinal herbs for acne probably work best when combined with a high fiber, low allergy diet, lots of water and supplements containing zinc, vitamin C and E, preferably in a formula designed for skin complaints. Tea tree oil (Melaleuca alternifolia) is one of the best available herbs for acne with anti-bacterial properties. 1Carson, C. F., K. A. Hammer, and T. V. Riley. “Melaleuca Alternifolia (Tea Tree) Oil: A Review of Antimicrobial and Other Medicinal Properties.” Clinical Microbiology Reviews 19.1 (2006): 50–62. PMC. Web. 18 Sept. 2018. In the formation of acne bacteria plays a specific role and of those bacteria, Propionibacterium acnes and Staphylococcus epidermis are the most studied. Both of these occur naturally on the skin, and neither has been shown to be the cause of acne. But when sebum production changes, or it becomes inflamed, these bacteria often multiple and may aggravate the inflammation. The tea tree oil can be diluted with jojoba oil (25 to 50%) before it is applied directly to the acne, usually 2-3 times daily. Jojoba oil is often used because it is known to have an anti-inflammatory effect. Tea tree oil should not be used internally. The antibacterial compounds in this herb are berbamine and berberine, which are also believed to reduce sebum production and kill bacteria when used topically. When used internally, these compounds are liver tonics that improve bile flow, stimulate digestion and act as a tonic on the bowel wall. Topically, goldenseal (Hydrastis Canadensis) is an effective antibacterial, mainly due to its berberine content. When used in combination with marshmallow to soothe inflamed skin it will reduce redness and eliminate bacteria causing infection. Internally, goldenseal has historically been called the “King of Tonics,” and is used as an antibiotic, liver tonic, and will increase bile production which in acts to detoxify the body by increasing elimination. Together, burdock (Arctium lapp), yellow dock (Rumex crispus) and dandelion (Taraxicum officinalis) work as what once was referred to as “blood purifiers.” Today these herbs are used to improve digestive function by increasing the output of bile from the gallbladder into the small intestine. Many traditional herbalists will prescribe these herbs together as an overall tonic for the liver and gallbladder. Echinacea (Echinacea angustifolia, Echinacea purpurea) is also one of the herbs for acne with antiseptic properties. It can be used as a tincture mixed with 50% water and applied directly to the skin. Echinacea may also be used to strengthen the immune system and in turn cleanse the skin from within. A scientific study from 2003 strongly indicated that dong quai (Angelica sinensis) might have a positive effect as an herbal remedy for acne. The scientists discovered that the herb has a similar impact to that of erythromycin, an antibiotic often prescribed as a medicine for treating acne. 3Priyam Sinha, Shruti Srivastava, Nidhi Mishra, and Narayan Prasad Yadav, “New Perspectives on Antiacne Plant Drugs: Contribution to Modern Therapeutics,” BioMed Research International, vol. 2014, Article ID 301304, 19 pages, 2014. Indian madder (Rubia cordifolia), also known as manjistha (Sanskrit), is a perennial plant that is used extensively in Ayurvedic medicine. The herb is believed to enhance and support the lymphatic system and thus contribute to healthier skin. Studies have confirmed that Indian madder does have anti-inflammatory and antibacterial properties and could be helpful as a remedy in preventing and treating acne. 4Chaudhary, Anand & Meena, Vandana. (2015). Manjistha (Rubia Cordifolia)- A helping herb in cure of acne. Journal of Ayurveda & Holistic Medicine. III. 11-17. Neem (Azadirachta indica) is another medicinal herb that has its uses in Ayurvedic herbal medicine. The neem oil contains substances that have antibacterial, anti-fungal and anti-inflammatory properties. Traditionally, neem has been used as an herbal remedy especially for ailments related to the skin such as acne, eczema, and psoriasis. Studies have shown that the herb does have antibacterial activity against Staphylococcus, a bacteria often associated with acne. Witch hazel (Hamamelis virginiana) has been used traditionally to treat various ailments related to the skin, such as eczema, varicose veins, burns, insect bites and acne. Devil’s horsewhip (Achyranthes aspera), a herb popular in Ayurvedic medicine, is traditionally used for the treatment of acne, boils, scabies, and other skin diseases. The herb contains substances that have been shown to have antiviral and antibacterial properties. Green tea, an unfermented dried leaves extract of the tea plant (Camellia sinensis), may be useful for acne when used topically. It contains tannins and flavonoids that have an antiseptic and anti-inflammatory effect. One six week study involving 20 patients suffering from mild to moderate acne, showed that external application of green tea to be effective compared with pretreatment. 6PubMed.gov – The efficacy of topical 2% green tea lotion in mild-to-moderate acne vulgaris. Old Man’s Beard (Usnea barbata) is a long, gray-green lichen that grows from tree trunks and branches. Extracts from the lichen have been shown to have an anti-bacterial effect. Miller, Lucinda G. & Wallace J. Murray: Herbal Medicinals. A Clinician’s Guide. Binghamton, Pharmaceutical Products Press 1998. Fisher, Kathleen: Herbal Remedies. Dozens of safe, effective treatments to grow and make. Emmaus, Rodale Press, Inc., 1999. Karen Kurtak – Effective and Lasting Treatment for Acne.